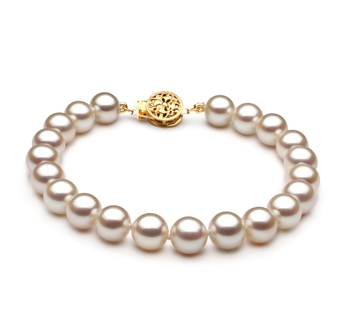 The beauty and clarity of the White Freshwater Pearl Bracelet shines through with the medium sized 7-8mm white pearls. The sheer and glistening power of the AAAA mirror like luster takes control and forms the basis for this bracelet. 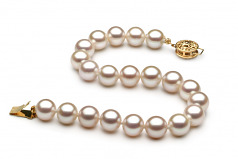 The subtle difference in the AAA shape of the pearls is made whole by the luster that glistens in around the surface. This bracelet is a go to piece in your armoire as it will bring together any formal, business or casual wardrobe without the need to over analyze the mix and match compatibility. The high quality of the freshwater pearls are hand strung on a fine double knotted silk thread with each pearl being separated by a hand tied double knot to ensure no rubbing by neighboring pearls.